Welcome to our Apex Legends Pistol List, here you can view the Best Pistol Stats in Apex Legends. Arguably the weakest of all the available gun types in the game, but in the hands of a skilled player, it can be just as effective as any other weapon. 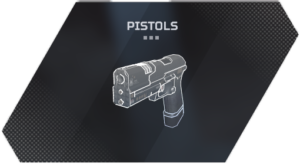 We display the Apex Legends Pistols using a Tier List format. You can view Apex Legends Best Pistols in the S Tier, we placed weaker option below with the weakest being in F Tier. Below we have a listed each of the Pistol Stats in terms of how much damage the will do when a bullet hits the body or head. Hitting the head will deal more damage and adding attachments to your weapon will also improve in various ways. -Hop-up 45 90 High powered revolver.